If you’re ever going to make it in in baseball and in life, you must start with 3 critical mind shifts. 1) Reject the Freak Theory… the elitists among us want you to believe that everything you become is predicated on the DNA you were given at birth. They want you to accept that only a chosen few with “God-given talent” have a shot success. It is arrogance at its finest, and it’s total crap! I’ve heard Coach Wolforth say it dozens of times and I agree… Your genetics determine where you start. They don’t determine where you finish. You and you alone get to decide that! 2) Cast Aside the Arbitrary Assessment of Others… Categorization of people and their potential… we all do it to some degree. It’s human nature. We meet someone for the first time, and we begin to size up who they are and what their capabilities might be. If you allow it, that’s what people will do with you. Some will even seem sincere in their desire for you to be realistic and to “play within yourself”. They’ll cloak it in the seemingly noble concern for not wanting give you false hope. They might mean well in their heart, but they are poison! Poison I tell you!! They think they have it all figured out. They think they know what “it” is supposed to look like and, whether overtly or subtly, they will let you know that you are not “it”. Balderdash!! Who the heck are “They” anyway? These ubiquitous yet elusive purveyors of cynicism and doubt must be sent packing! Delete them and their ridiculously unfounded assessments from your life. 3) Shatter Your Own Mental Barriers… Many of you are being held back by your own low expectations. You say you want to be great, but when it comes right down to it, you really don’t think you’re capable of it, and you might not even believe you are worthy. You’ll achieve some success and then you’ll begin to cower away from it, because you lack the confidence to feel like you belong. Listen to me! You are capable of far more than you could ever imagine. Shoot for the stars, I say! if you miss, maybe you’ll lasso the moon, and that wouldn’t be too bad. What have you got to lose. It starts with YOU! If you don’t believe, it will never happen. Get up and go get what you deserve! Those three tenets are the starting point for our Spring Training Elite Pitcher’s Boot Camp. You can become a powerful, elite level thrower. And we can help you do it. 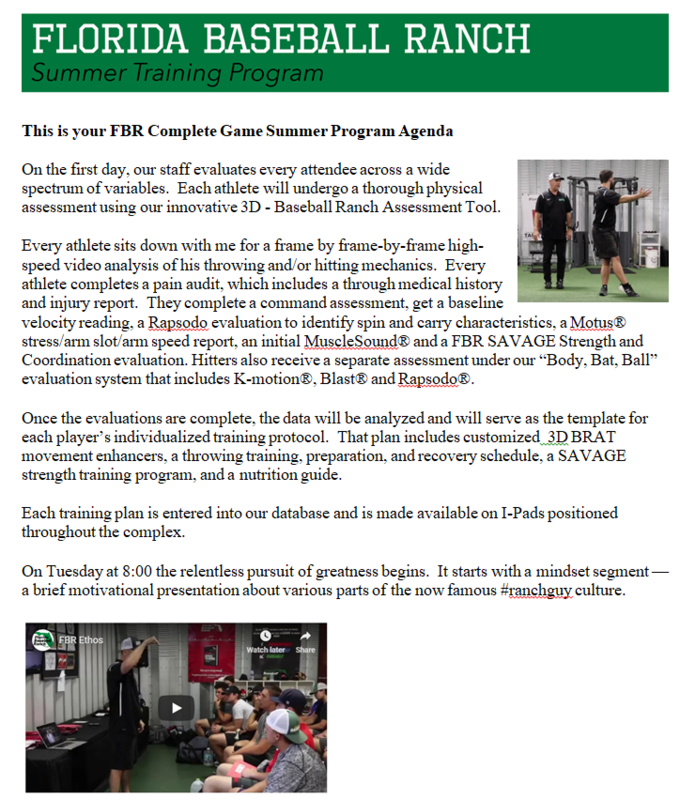 According to ESPN, “The Texas Baseball Ranch is leading a revolution in pitching that is sweeping the nation”, and we are proud to be a part of the process. At last count, TBR had produced 290 90mph throwers, and at the FBR, we have 164 of our own. I’ll do the math for you. That’s 454 dudes who didn’t throw 90, and now they do! The reason for this success is simple. The leaders and the instructors from both ranches truly believe in the mindset principles presented above. We live and breathe them every day. Also, we are insatiably curious and addicted to learning, so we constantly collaborate to develop innovative training models that have led to game-changing… make that life-changing improvements in our students. Once a year we get both ranches together for a huge Elite Pitchers Boot Camp here in Florida, and the magic and electricity is palpable! The energy our teams create always inspires everyone around us to achieve things they never dreamed they could do. This year, that magical weekend is set for March 10-12. Do you need to add velo, or solve that nagging arm pain once and for all? Then this is the place you need to be. It will change your baseball career for sure… and it might even change your life!! I know it probably sounds to good to be true, but you don’t have to take my word for it. Here’s what one recent college coach said after he brought his son to our most recent camp. Click Here to Learn About Our Spring Training Elite Pitchers Bootcamp. We are intentionally limiting the number of spots available and the early bird registration expires Feb 10th. Register now, lock in your spot and save $500! I am so convinced that this will be the most fantastic experience of your baseball life that I will give you my personal 100% money back guarantee. If this camp isn’t the best you’ve ever experienced, simply see me on the way our and I’ll be happy to give you a prompt and courteous reply.